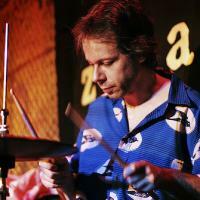 Tune in to Afternoon New Music on Monday, June 1st, for an interview with composer and percussionist Lukas Ligeti. Ligeti has established a large body of compositions often combining influences of jazz, contemporary classical, electronic, and world music. His work has been performed by a variety of premier ensembles, such as the London Sinfonietta, the Ensemble Modern, Kronos Quartet, and the Vienna Radio Symphony Orchestra. He will be in our studio to talk about his music and thoughts. Listen! Transcending the boundaries of genre, the Austrian, New-York-City-based composer-percussionist Lukas Ligeti has developed a musical style of his own that draws upon downtown New York experimentalism, contemporary classical music, jazz, electronica, as well as world music, particularly from Africa. Known for his non-conformity and diverse interests, Lukas creates music ranging from the through-composed to the free-improvised, often exploring polyrhythmic/polytempo structures, non-tempered tunings, and non-western elements. Other major sources of inspiration include experimental mathematics, computer technology, architecture and visual art, sociology and politics, and travel. He has also been participating in cultural exchange projects in Africa for the past 15 years. Born in Vienna, Austria into a family from which several important artists have come including his father, composer György Ligeti, Lukas started his musical adventures after finishing high school. He studied composition and percussion at the University for Music and Performing Arts in Vienna and then moved to the U.S. and spent two years at the Center for Computer Research in Music and Acoustics at Stanford University before settling in New York in 1998. His commissions include Bang on a Can, the Vienna Festwochen, Ensemble Modern, Kronos Quartet, Colin Currie and Håkan Hardenberger, the American Composers Forum, New York University, ORF Austrian Broadcasting Company, Radio France, and more; he also regularly collaborates with choreographer Karole Armitage. As a drummer, he co-leads several bands and has performed and/or recorded with John Zorn, Henry Kaiser, Raoul Björkenheim, Gary Lucas, Michael Manring, Marilyn Crispell, Benoit Delbecq, Jim O’Rourke, Daniel Carter, John Tchicai, Eugene Chadbourne, and many others. He performs frequently on electronic percussion often using the marimba lumina, a rare instrument invented by California engineer Don Buchla. His first trip to Africa, a commission in 1994 by the Goethe Institute to work with musicians in Côte d’Ivoire, embarked him on an exploration of cross-cultural collaboration that continues to this day. In Abidjan he co-founded the experimental, intercultural group Beta Foly which led to the release of his first CD as a bandleader, Lukas Ligeti & Beta Foly in 1997. He has worked with Batonka musicians in Zimbabwe; collaborated with Nubian musicians in Egypt which culminated in a concert at the Cairo Opera; and composed a piece for musicians from various Caribbean cultures which premiered in Miami Beach. In 2005, Lukas was featured at the Unyazi festival in Johannesburg, the first electronic experimental music festival in Africa, and in 2006, he was composer-in-residence at the University of the Witwatersrand in Johannesburg. Lukas traveled to Uganda in 2007 to collaborate with the music/dance/theater group, the Ndere Troupe. In 2008, he taught composition at the University of Ghana at Legon (Accra), and in 2010 he collaborated with musicians in Lesotho, focusing on the lesiba, a rare traditional instrument that is in danger of extinction. Lukas’ band Burkina Electric, based in Ouagadougou, Burkina Faso, combines African traditions with electronic dance music and has been touring internationally, with recent performances at the BAM Next Wave Festival and central Park Summerstage in New York, the Luminato Festival in Toronto and the Montreal Jazz Festival. Burkina Electric’s debut CD, “Paspanga”, was released in 2010 on Cantaloupe Records. Lukas most recently toured in the midwestern U.S. and Canada in support of his electronic percussion solo CD Afrikan Machinery (Tzadik Records), performing at venues such as the Museum of Contemporary Art in Cleveland, the Contemporary Arts Center in Cincinnati, and the Music Gallery in Toronto. Prior to that tour, he gave solo concerts in the UK, performing at the London Jazz Festival. He also completed a month-long curatorial project at The Stone in NYC and an American Composers Orchestra commission and world premiere of “Labyrinth of Clouds” at Carnegie Hall with Lukas on solo marimba lumina. Lukas also recently received the 2010 Alpert Award in the Arts for Music.